This is the 4th article in this series. 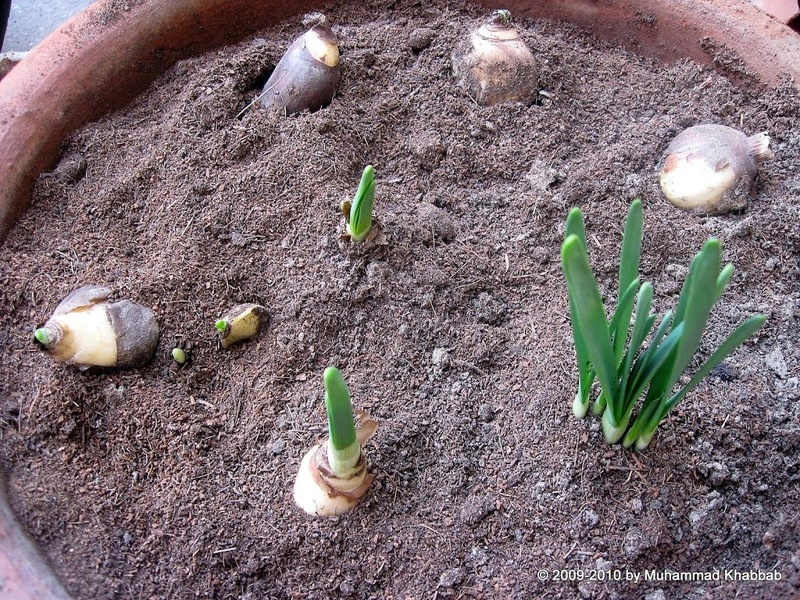 Today i will share with you tips for growing flowering bulbs in warm climates – Narcissus. 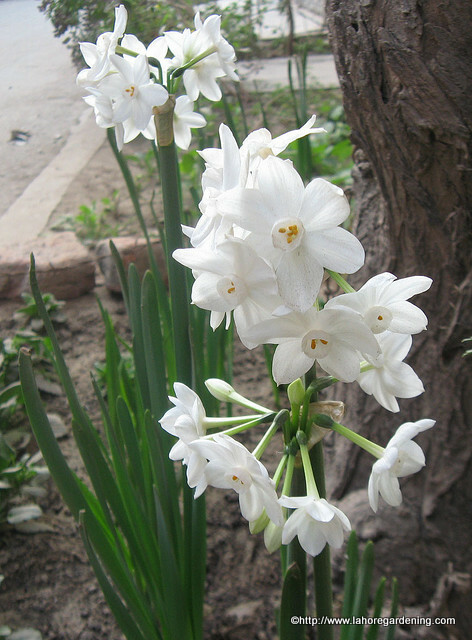 There are many varieties of Narcissus available in lahore in fall. One of them is Grand Soleil which is a fragrant one having yellow flowers, a bit expensive though. The other one is paperwhite which gives pure white flowers and very cheap costing only Rs 10 per bulb. This is the one you are going after as it is very hardy, very tolerant of poor soil and does not care whether planted in sun, semi shade and even full shade. And if that is not all, it does not mind drought as well. So for a careless gardener, it is a perfect bulb to try. I have heard that they are easy be forced as well but i could not try it this year. 1-Buy fattest and biggest bulb possible. Try to get those having baby bulb-lets attached. Buy as early as possible. Plant them on regular intervals so that supply of flowers is continuous in spring. 2- Bury them till the neck. Their roots need depth and very vigorous, i find 10 inches pot not enough for their long roots. 4- Water just once after planting and NOT after that until you see some top growth. Remember less watering is the key to flowering for paper whites. They are very tough and do not mind drought for a long period. More water will promote foliage but no flowers. 5- You can give light liquid fertilizer or little cow dung manure but if you don’t, they won’t mind. 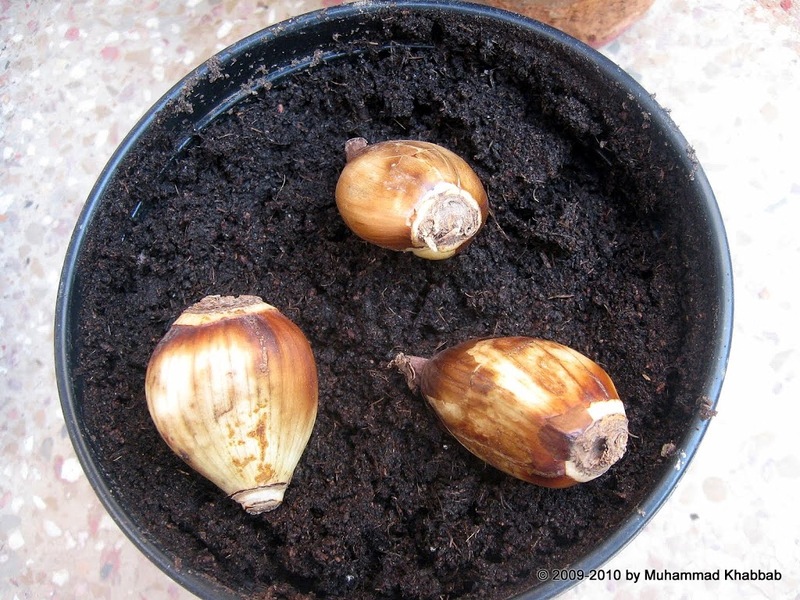 6-Do not worry if the bulbs pushes itself upwards because of roots growth. Mine did that a lot. Again, do not tempt to water seeing them coming upwards. And this was the progress after 1.5 months. They should be flowering right now and i will share the pics as soon as they appear. There are some barren areas in my soil bed and i put these bulbs over there as only they will survive there. You can see the baby bulbs also growing with parent ones. 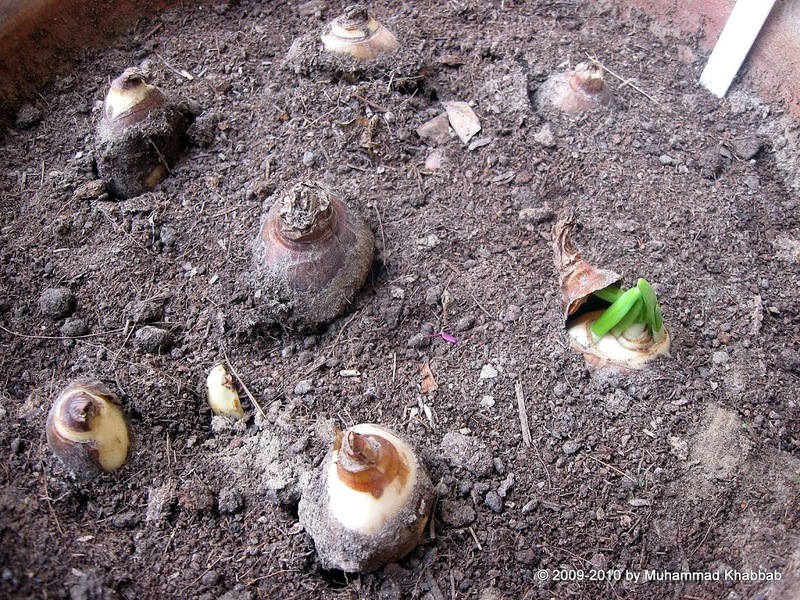 You can save bulbs for next season when flowers are over. And this is how they look pure white and fragrant blooms. Almost all varieties of narcissus are perennial in lahore and come back every year. Keep them in soil after flowering is finished and give just enough watering not to let it dry out. Bulb will sprout again in september. I have not been succesful in growing narcisus and their bulbs are not easily available here. How I wish I can grow them as they are vey auspicious for our Chinese New Year celebrtions. Wishing you a Happy New Year 2010 and Happy Holidays! I have some sitting in my fridge since last Christmas, got them as a gift from the UK. I must remember to plant them out. Have yours ever flowered? They look very healthy. A Happy Healthy and Peaceful New Year to you and your family. Love your directions for narcissus. Can’t wait to see the blooms. I’m envious. Your plant grew so much in so short a period. Sigh. Lucky guy! paperwhites are definately my favorite flowering bulbs specially that here the climate is mostly warm.. thanks for the inspiring pics! 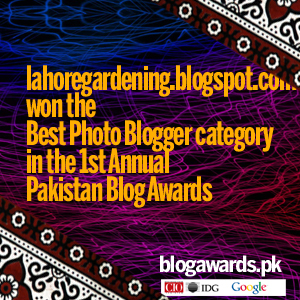 I planted some bulbs in beds and they followed the exact steps that you have mentioned, this is end of march in Lahore but i am still not able to get the flowers, can you advise. They flower in January in lahore you must have planted them late. 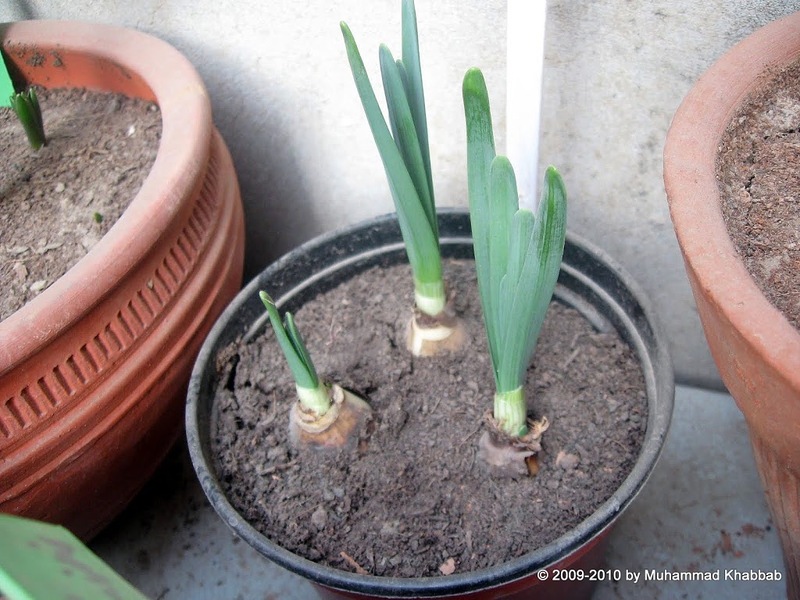 Sometimes the bulbs are of poor quality and they do not have flower bud inside them so they do not bloom. Only paperwhite and freesia can be planted in october. 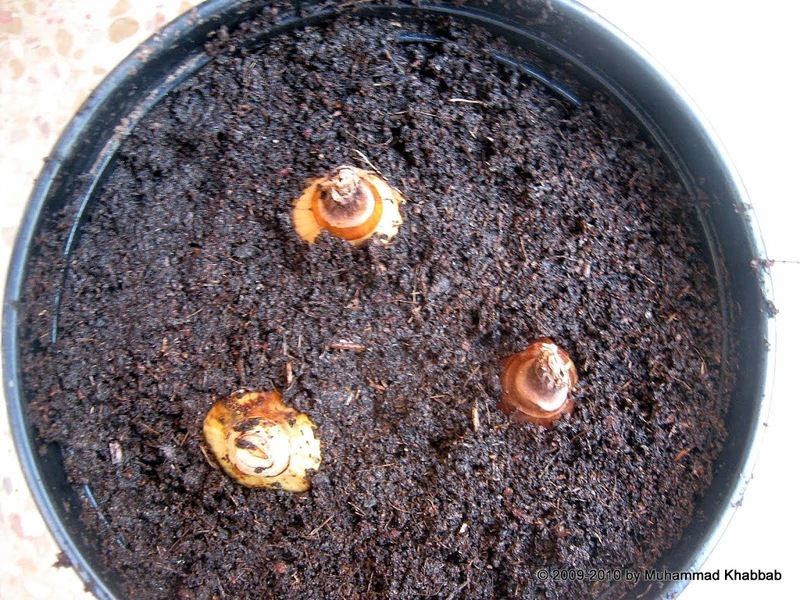 Remaining bulbs should be planted around November 15. 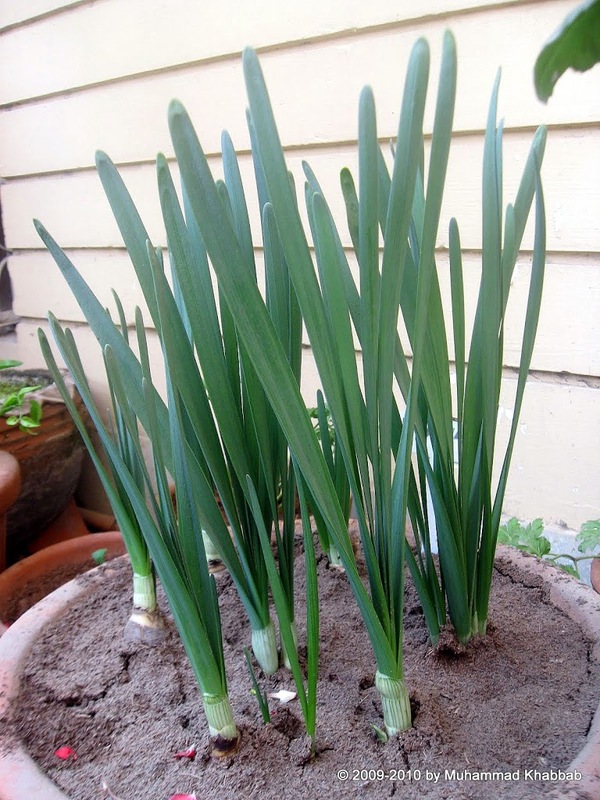 It is better to plant later than early specially for cool climate bulbs like hyacinth, lilies etc.